Why, I have to ask, WHYYYYYY?!?!?!?!? Maybe her man likes pikachu… and….. I’m out of ideas…..
Is it just a badly taken picture, or is there something REALLY wrong with HK’s left eye? It wouldn’t be so bad if the sword wasn’t there. Ha. 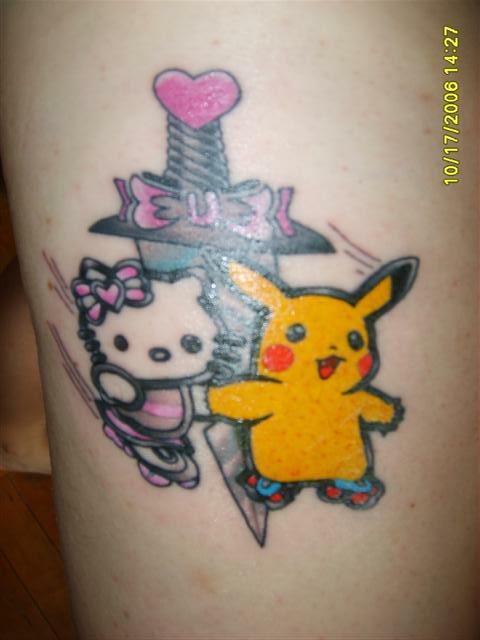 I’m sorry to say that I haven’t tattooed a hello kitty pikachu and I never will. I think it irks me more that that tattoo is so badly done. I still can’t believe that you are so insulting to all the people that send you photos. You are going to be playing a different tune when they all realize what a beast you really are and stop sending them. Then what are you going to do? It’s a matter of time. It would be nice if you used the knife and put us all out of our misery having to rad your absurd blogs. Everyone knows all other characters want to be with Hello Kitty. It’s a privilege. Pink, Hello Kitty and roller skating all go together well making it a wonderful tattoo. But the bows on the wrong side of her head! since its taking darlene so long to od on her precious pepto why doesnt she just use that knife on herself? Similar to the ‘Pro Wrestling’ shot below. Perhaps that is really Pikachu in the mask. I want to get really drunk and tattoo this on someone. I just want to. Maybe we can get darlene all doped up on Pepto so we can tie her down and I could tattoo her dumb a$$. Gimme a bottle of Jack and I’ll do it. I don’t have a tattoo artist’s license or whatever they need. Screw it. … don’t kitties eat mice? You know, the more I look at it, the less it looks like “real” tattoo. Reminds me of those “child-tattoos” that wash off after a while. I suppose this is for real, though. There’s just too much going on in the picture, like three different tattoos put together on top of each other. And all the colours!!! Remove Pikachu and HK, and I might–MIGHT–like the pink bow-tied knife. @Brian: God Bless you for saying you’ll never do one of these! @andophiroxia: I’ll help hold her down!!!! Please tell me this is a fake one!!!! The kind that wash off after a few days, because I don’t see how someone would do that to their skin and live with it the rest of their life! Man when you plan on getting a real tatoo you think about it (I know I did) and if you think you really don’t get stuck with such a thing. HK is a cute character, one a few random items NOT on the skin, and pikachu???? Ugh! Could it be something more ugly that that? Between those two cartoon the world is surely dominated, that’s what’s going to happen the day Sanryo and Nitendo decide to merge. And might i just add MIMMY’s right eye looks abit wonky, like it’s falling out…? Weird. This site ROCKS!!! I love everything on it!!! That’s an ugly tattoo- it isn’t very well done either. The cat’s eye is all wonky, the lines are too thick, and the sword looks like it’s drawn by a sailor-moon obsessed 12-year old. That really is a bad tattoo.. My mom has one on her ankle which is pretty poorly done too. I plan on getting one though in honor of my mom! Really, I love Hello Kitty, but my mind hasn’t been warped to the point of buying my boyfriend anything Hello Kitty related… Unless I was playing a cruel, cruel joke. But you can rest easy knowing that whenever I beg and plead to buy some Hello Kitty item, he refuses… One more HK fanatic deprived of her sweet fix. I’m currently unemployed (curses…), but when I find work, that’ll alllllll be changing >:D I’ve met Hello Kitty in person at the Sanrio store at the Mall of America. THAT was a little scary.. You poor man. Hopefully I can buy out your wife’s Hello Kitty stock on eBay as well 😀 I’d love that!!! how could anyone dare diffile Pikachu with that MONSTER!!!!!!!!!!!!!!!!!!!!!!!!!!! ow, those colors don’t match up at all, it hurts my eyes, and i don’t recall pikachu having such weird looking fingers. See Perez Hilton’s puppy dressed up in a Hello Kitty hat! Haha and he doesn’t like it one bit! ha ha ha ha rotflmaohms!!!!! This tattoo totally took my favourite thing and my brother’s favourite thing and mashed it together… neat. So many colours… it really does not look like a real tattoo. Wow. Three of my favorite things in life are Hello Kitty, Pokemon, and roller skating. I did not know that their powers combined could equal something so hellish. I think it looks kawaii. Not one one for a tat unless it’s well hidden. Sanrio had Hk with Paul Frank’s monkey Julius, also with Blue’s Clues Blue, Tokidori, and proposed a limited run with Tweety Bird from WB. what i like it… [[unique]]. NOOOOOOO! I like Pikachu! Why’d they do that, WHY?! To each their own, people criticize too much. I like it’s unique quality. uhm… too bad hello kitty’s bow is ALWAYS on the right side when youre facing her..
therefore, this cant be legit. best tattoo ive seen in ages ! WTF!!!!!! why would anyone in their right mind put hello kitty and pikachu together. her eye is messed up anyways, and the bow is on the wrong side. really? come on now. As well as she has been drawn onto this persons skin (there are an abundance of TERRIBLE depictions of Hello Kitty in tattoo form) I sadly have to say, this this is NOT Hello Kitty. Once again (If you’ve read any other of my tattoo comments) this is Mimmy, Hello Kitty’s sister. This just proves the stupidity of some Hello Kitty fanatics.